More people are choosing franchising as the way to own a business. In fact, franchising is the leading growing method for conducting business. The U.S. Department of Commerce reports that franchise sales accounted for almost one trillion dollars in 2010. Power of Franchisee Today over 41% of all retail businesses in the world are franchised operations and it is anticipated to be 50% within the next decade. Power of Franchisee Approximately 950, 000 franchised locations exist, employing over 11,000,000 people. Why do people choose franchising? Because it offers proven methods of operation that permit the franchisee to capitalize on the experience and expertise of an established organization. That can ensure your peace of mind when starting and operating your own business. Various studies report that approximately 80% of all small businesses fail within five years and 47% of the businesses fail within the first year. Yet, over 90% of all franchises succeed! Based on these statistics, the U.S. Department of Commerce has concluded that franchising "vastly increases the likelihood of success on the part of the small business person - it offers both a degree of flexibility and security not possible under other marketing systems." Because franchising offers a formula for operating a proven business, it is rapidly growing. Sales through franchised outlets continue to increase. Now you have the opportunity to become part of our franchise development - and own your own Brainwonders franchise. What goes into an Brainwonders franchise? Your initiative. Your resources. Your hard work. Your commitment. Your entrepreneurial spirit. Your desire to have control over your future. Your need for independence. Your love of children. Combine these qualities with our knowledge, expertise, services and techniques and our unique franchise opportunity and together we can enjoy a mutually rewarding business relationship. 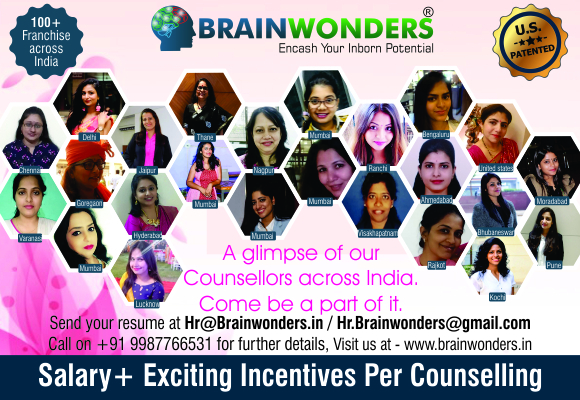 Brainwonders is an opportunity you cannot afford to dismiss! "We have more than 90 franchisee in India and 4 abroad."